The word “swag” means different things to different people. For the kids these days (who will not stay off my lawn, I might add), it’s a synonym for “cool,” something you have when your hat is at just the right angle. For interior designers, it means a curtain draped across a rod. But for marketers, swag means one thing: the free loot we get at trade shows, conferences, or in the mail. I love swag, at least in the “free stuff” sense of the word. And I’m thrilled we came up with some great swag to band together our community of Sophisticated Marketers. If you haven’t heard yet, when you join the #SophisticatedMktg movement we’ll mail you a decal to stick on your laptop, desk, or incredibly chill pet (please don’t actually do that). When you get the decal, don't be shy. Find a fun, creative way to show it off. Then, simply share your creation on social media with the #SophisticatedMktg tag to get our attention. 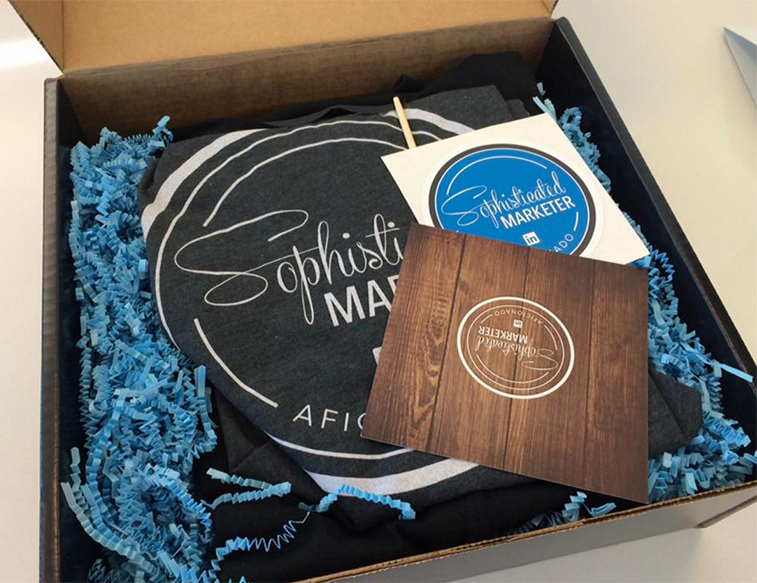 Once a month, we will pick our favorite entries and mail out an entire #SophisticatedMktg Swag Trunk. Rest assured we didn’t choose the items in this trunk at random. Each one is deeply symbolic of the way Sophisticated Marketers do their jobs. Let me break down the contents and explain why we picked each one. Some might argue that the humble T-shirt is the most basic unit of swag. It’s practically compulsory. Why would we include something so uninnovative? In reality, though, the T-shirt is popular as a swag item because it works. People keep them. People wear them. Plus, it’s the only piece of swag that is safe to deliver via cannon. So we included the T-shirt to remind you that you don’t always have to chase the next new thing. And you don’t have to avoid an old tactic just because it’s old. Take email marketing, for example: It’s one of the oldest digital marketing tools, and still one of the most effective. Master what already works before you chase something new. Wear the T-shirt. Sophisticated Marketers have layers. We know how to write great content and how to optimize it. We know how to write a compelling social media message, and we know when and how to use paid ads to boost it. The most sophisticated among us understand the entire process, from creating a strategy to measuring and improving. 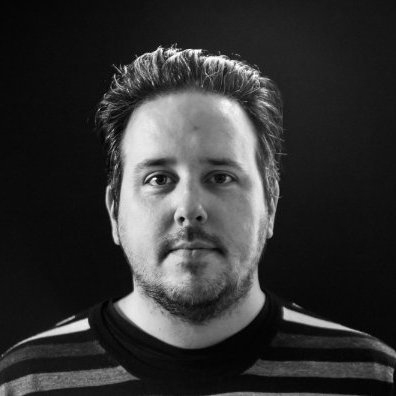 The hoodie is a reminder of all the layers of sophistication a marketer can master. In addition to being deeply symbolic, it’s also seriously comfy. And it lets you display your sophistication even when it’s too chilly to wear just the T-shirt. Sometimes, sadly, you can’t get away with wearing a T-shirt or a hoodie. Even the most casual of marketing departments require you to dress up every now and again. So we included the Sophisticated Marketer’s pin. Put it on your event lanyard, your messenger bag, or your lapel, and you can continue to showcase your sophistication even in the most formal of circumstances. In that way, the pin is symbolic of bringing personality to the most professional of content. Not every B2B company is going to look good in the content equivalent of a T-shirt – but that doesn’t mean you have to go for a featureless three-piece suit. Add some flair! Let the pin remind you to keep your sophistication on display at all times. Sure, we added the mustache just for laughs. But that makes it perhaps the most deeply symbolic item in the whole trunk. It serves to remind you that sophistication doesn’t have to mean pretentious or stuffy. We can be the smartest cats in the room, and we can take our marketing seriously, but we’re still human. If you have a little fun creating your content, people are bound to have more fun consuming it. Plus, the mustache is a great prop to use in your next marketing department photoshoot. These books serve to remind you that a truly sophisticated marketer never stops learning. They’re all books that have inspired the team at LinkedIn Marketing Solutions, and we hope they will do the same for you. We won’t say which books will be in your trunk, but we’ll pick them from our must-read list. So there you have it: the #SophisticatedMktg Swag Trunk is packed with goodies that are not only (mostly) useful, but are all reminders of the traits that make marketers truly sophisticated. Ready to win a swag trunk for yourself? Join the #SophisticatedMktg movement to get started.